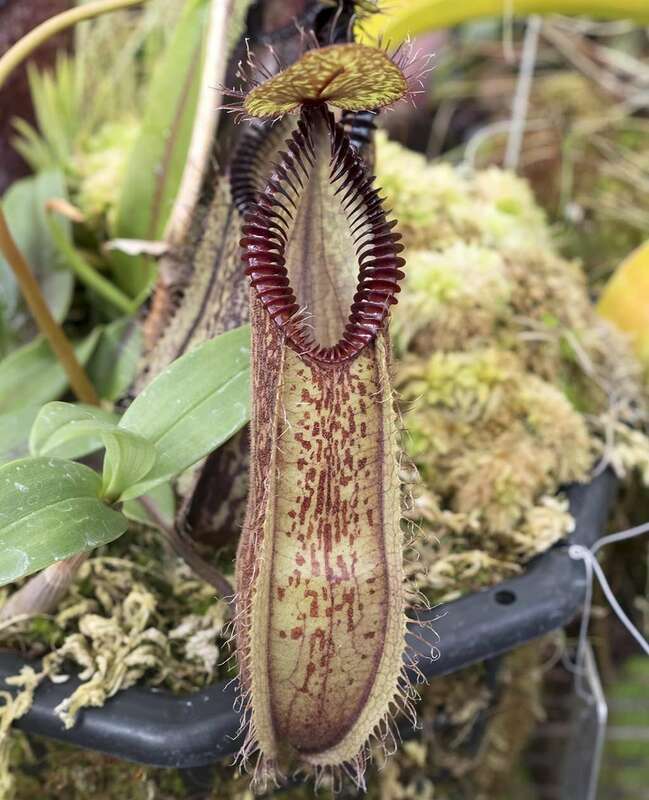 Now as to N. Veitchii. 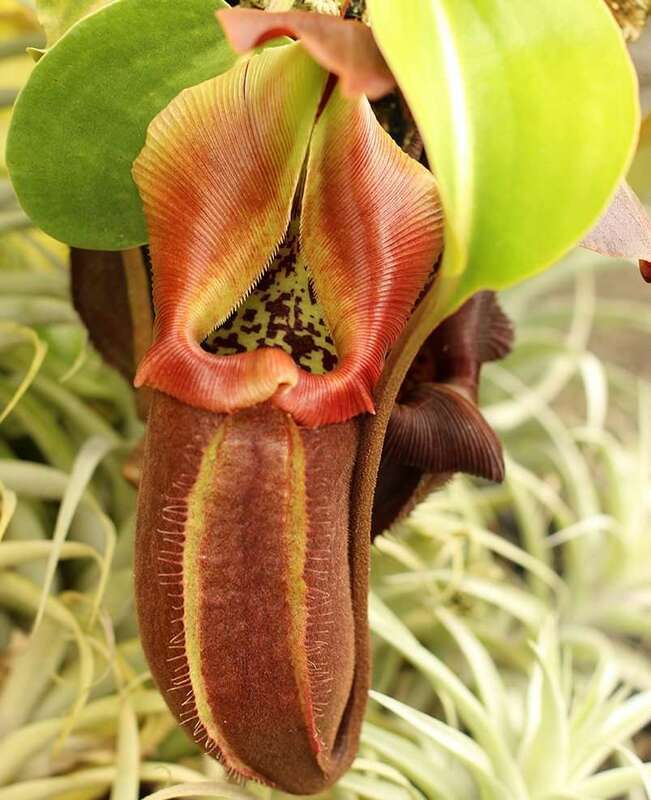 This is a true epiphyte. 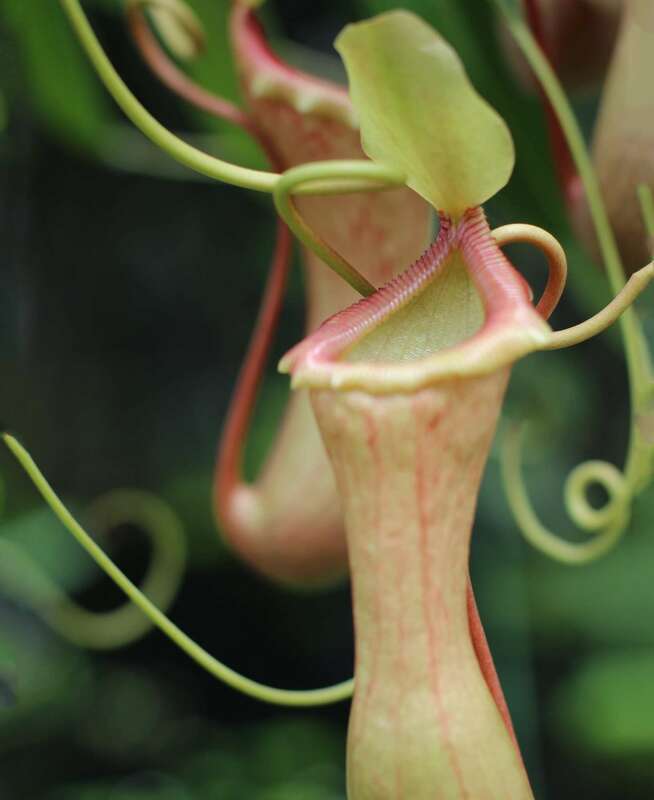 I never met with it on the ground anywhere, but in great quantity 20—100 feet high on tree trunks. 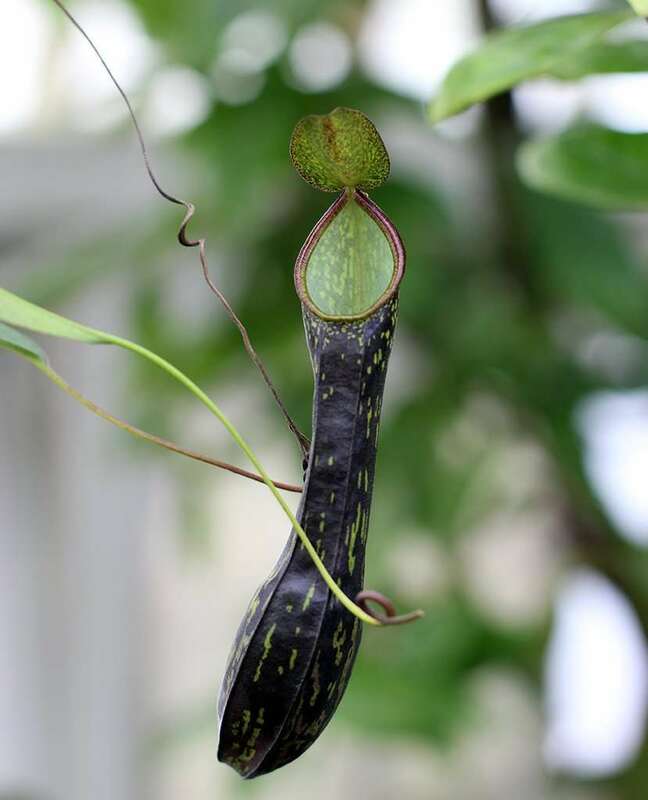 Its distichous habit is unique, I fancy, and then some of the leaves actually clasp around the tree just as a man would fold his arms around it in similar circumstances. 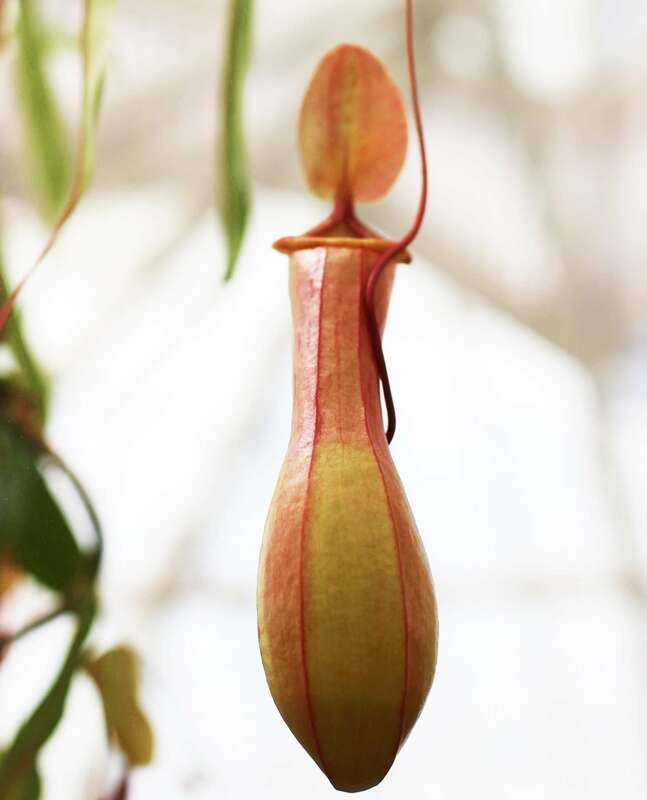 No other species of Nepenthes, so far as I know, has this habit. 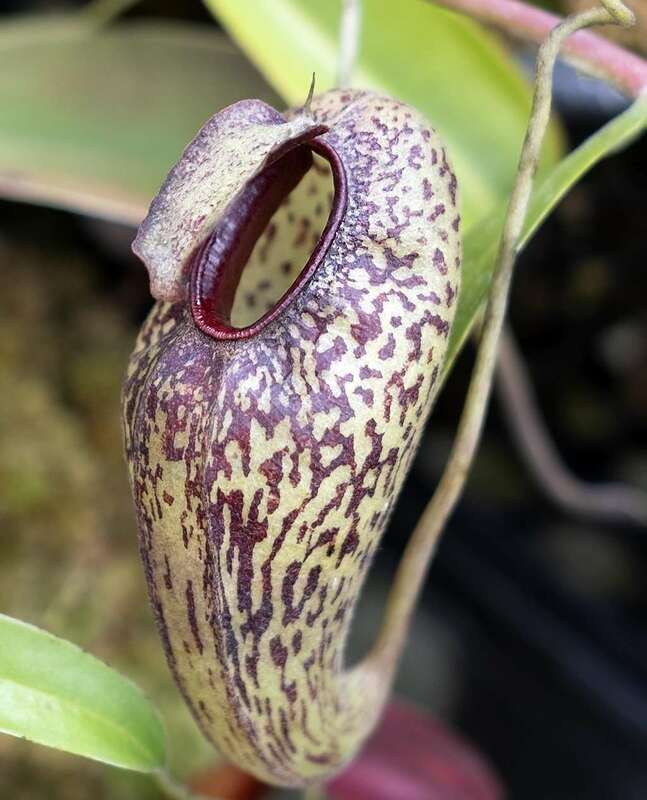 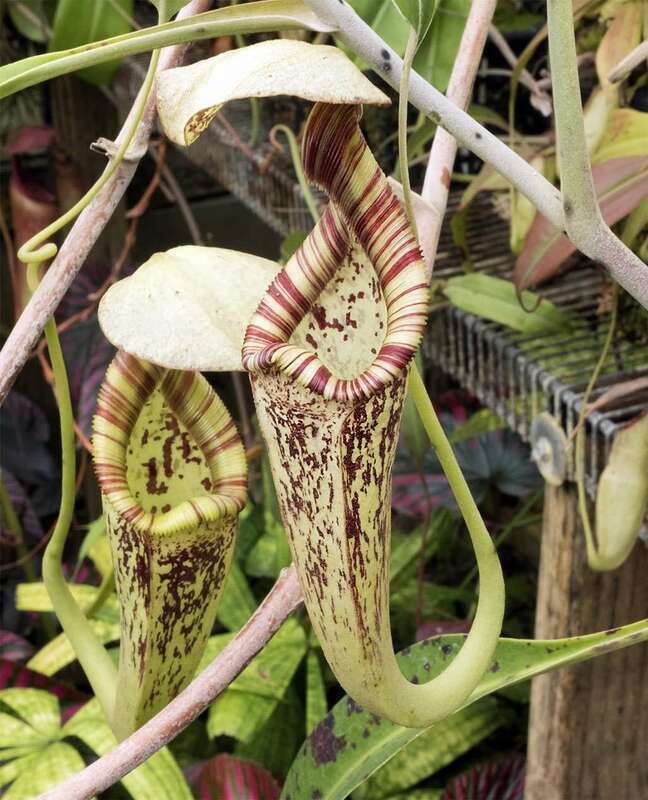 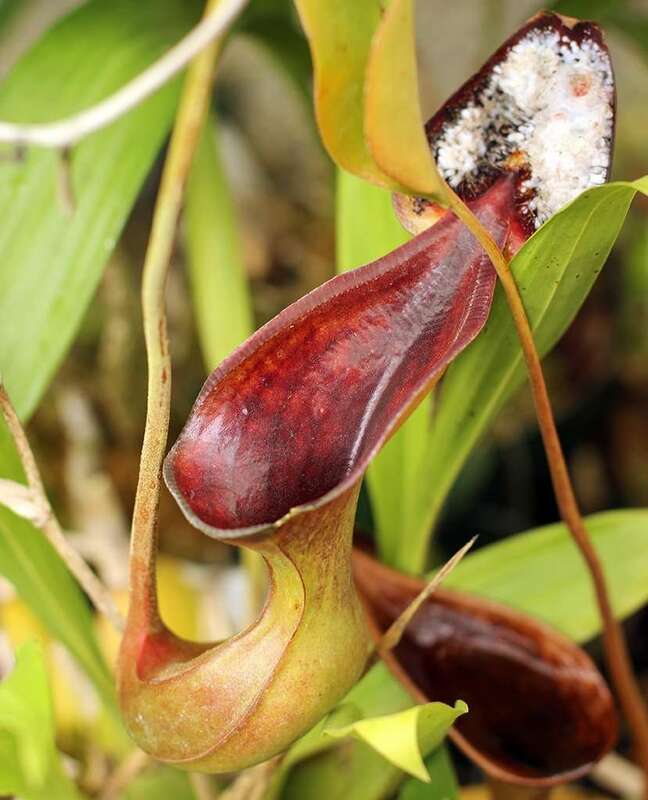 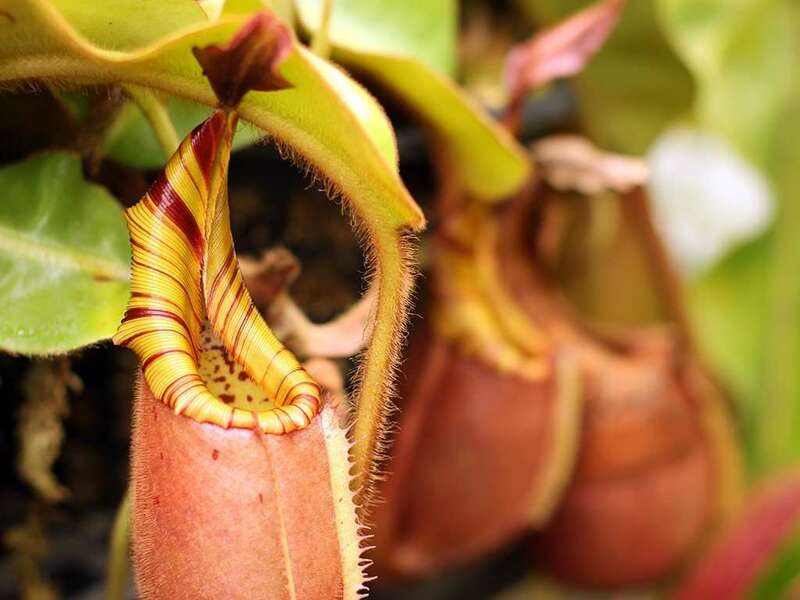 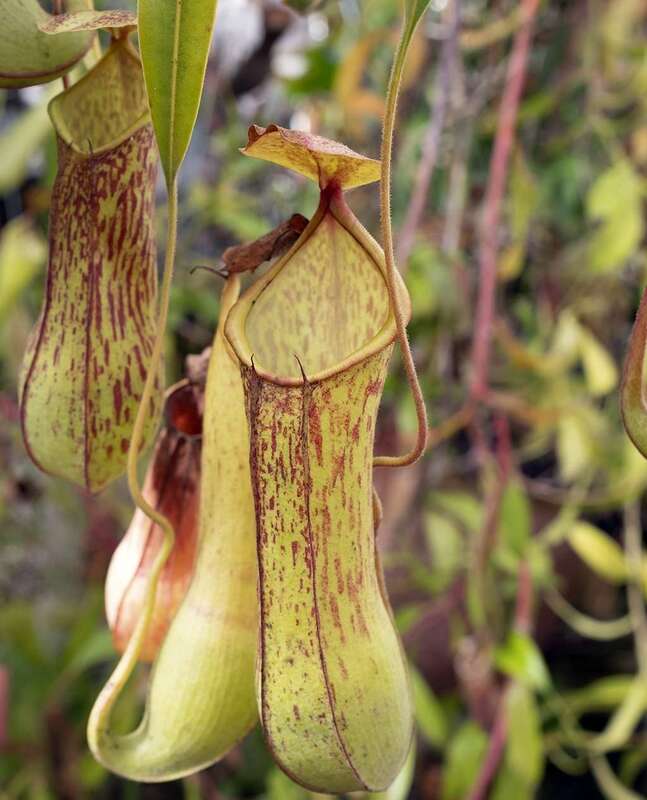 Nepenthes veitchii is named for great Victorian nurseryman, James Veitch, son of John Veitch, founder of Veitch Nurseries in the early 1800’s. 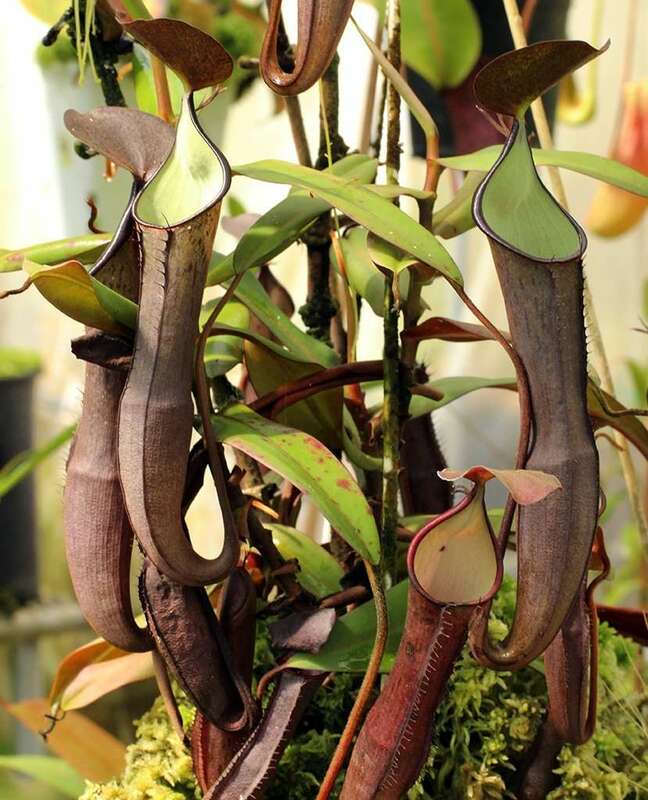 Veitch Nurseries introduced 1281 rare and exotic plants into cultivation by World War I. 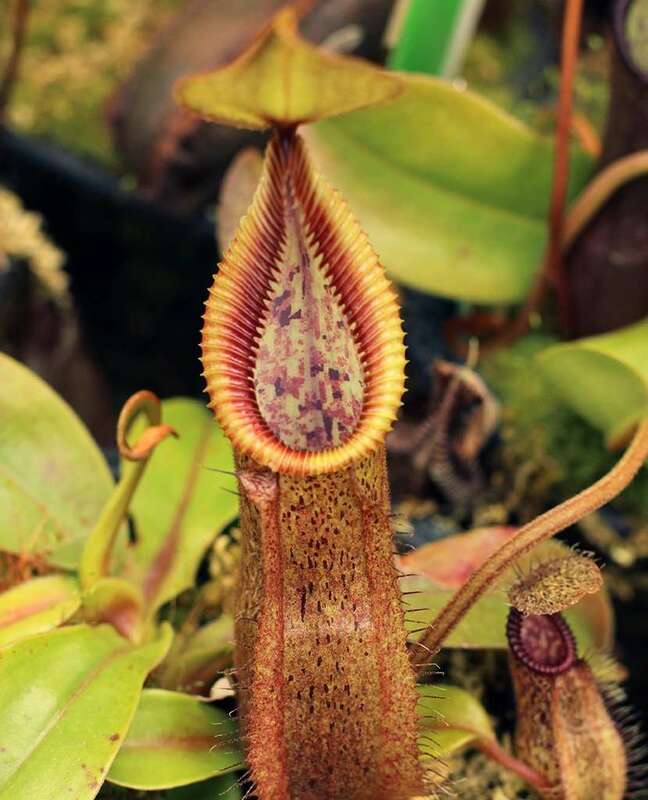 Look at that peristome! 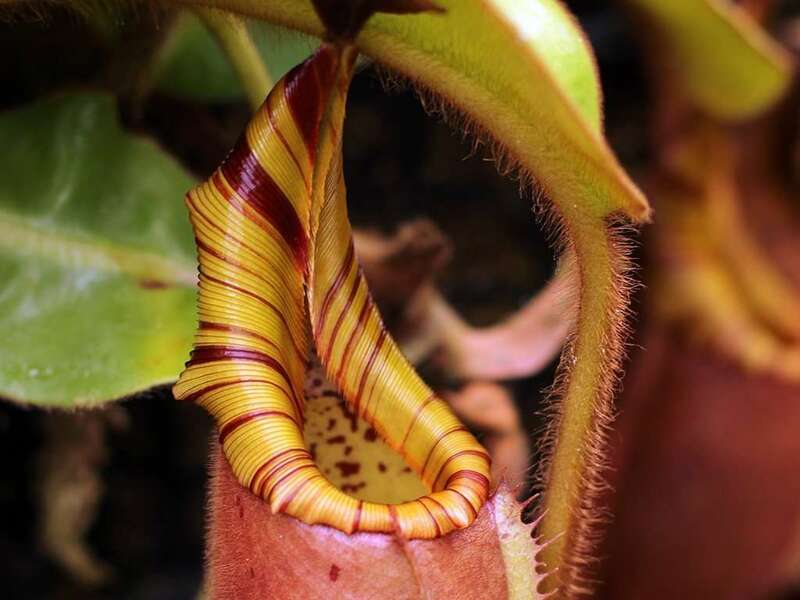 It’s vertical, flared, and golden brown with candy cane red pin striping. 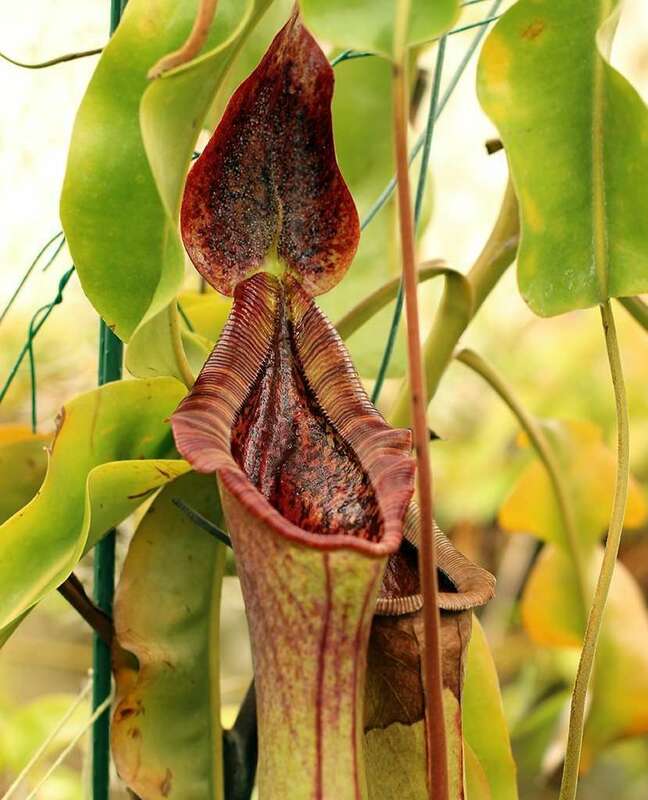 If I were an insect, I’d totally lick that… but I digress. 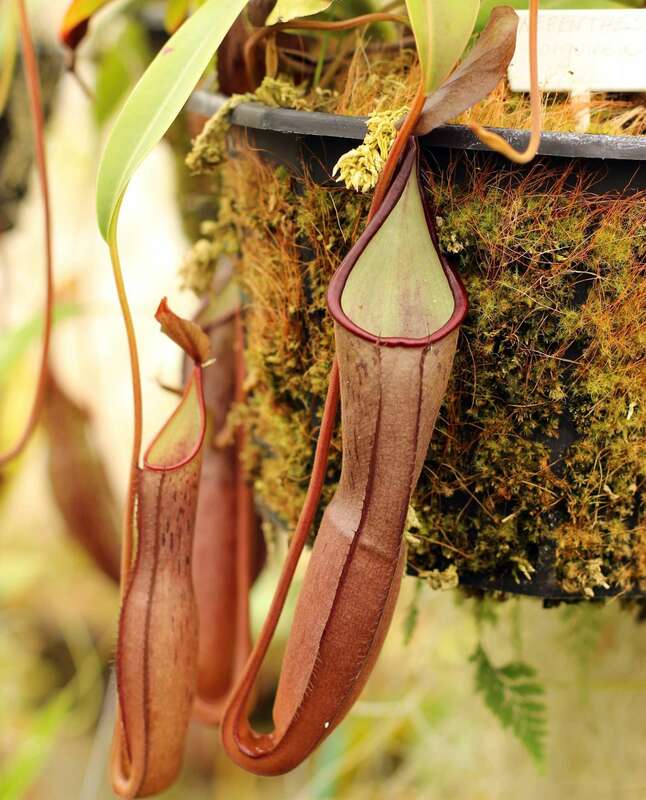 This flared peristome, combined with thick tendrils anchor Nepenthes veitchii to tree trunks, helping it to climb epiphytically. 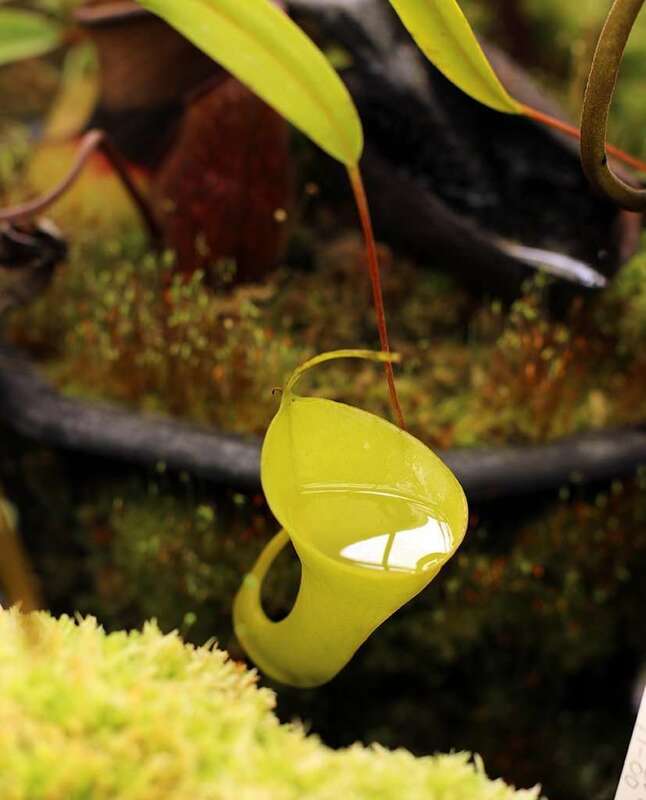 Highland varieties can have a harder time finding trees to scale, and can be found vining across the ground, suspended from tubby pitchers. 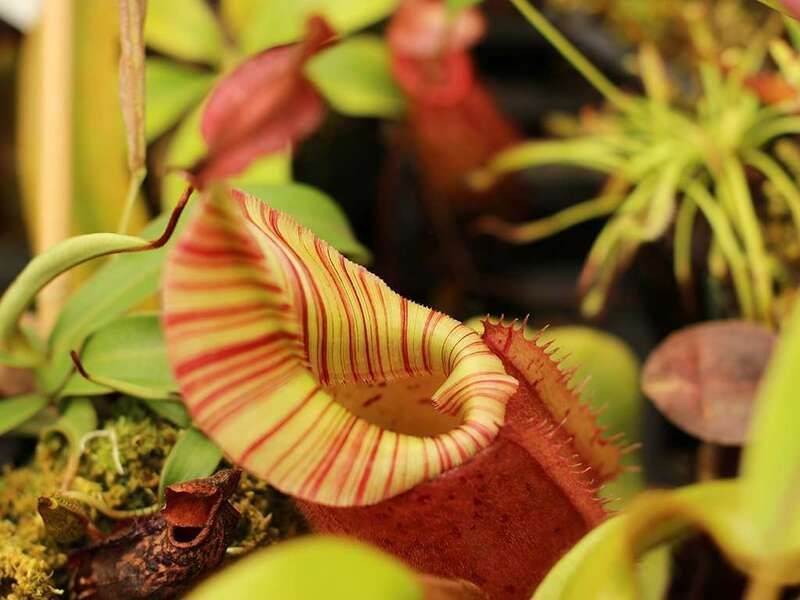 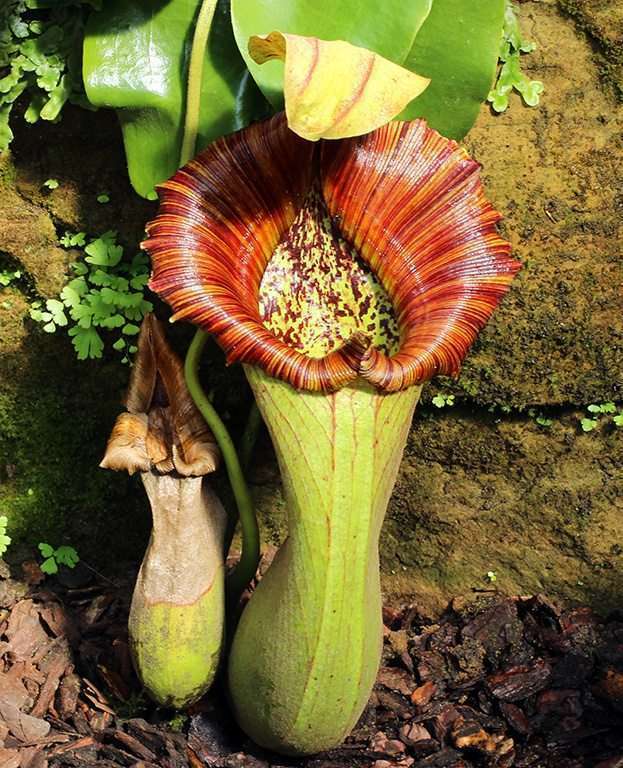 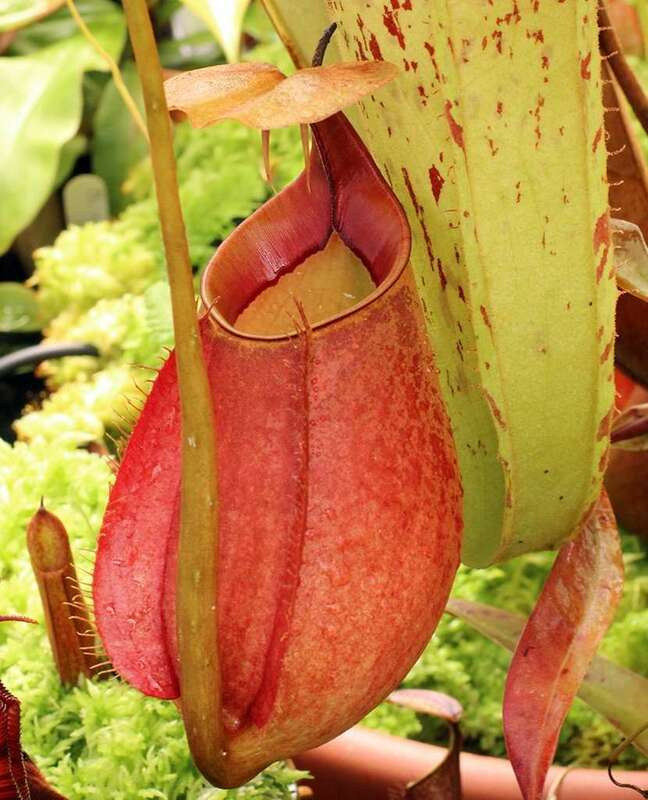 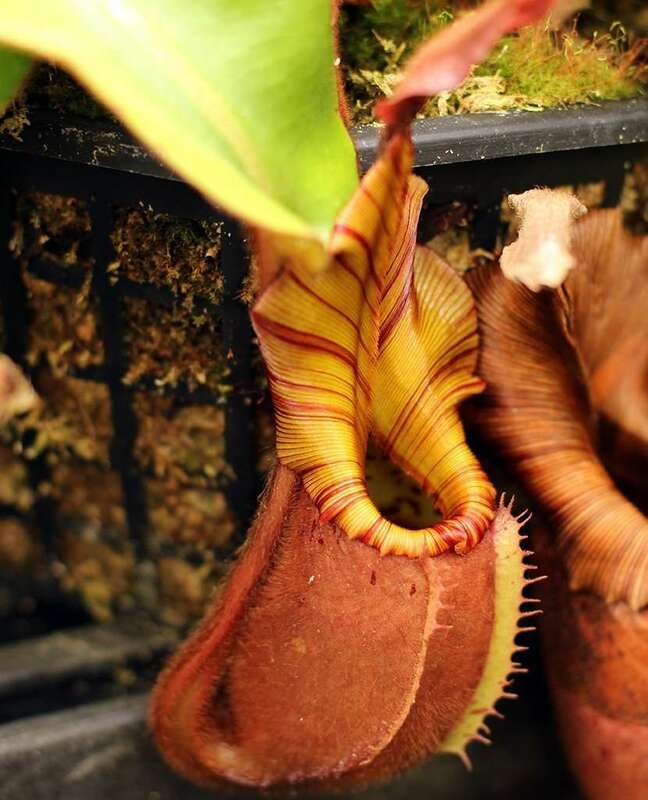 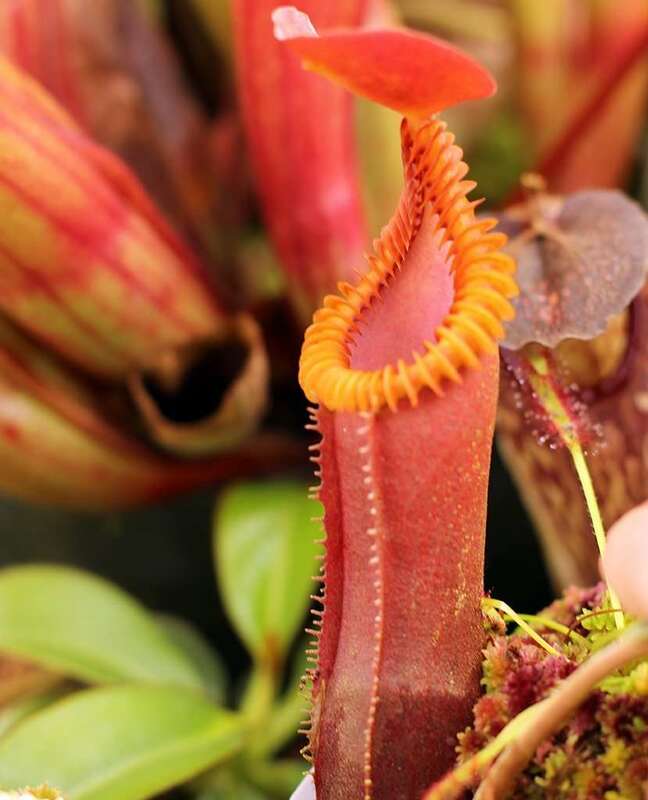 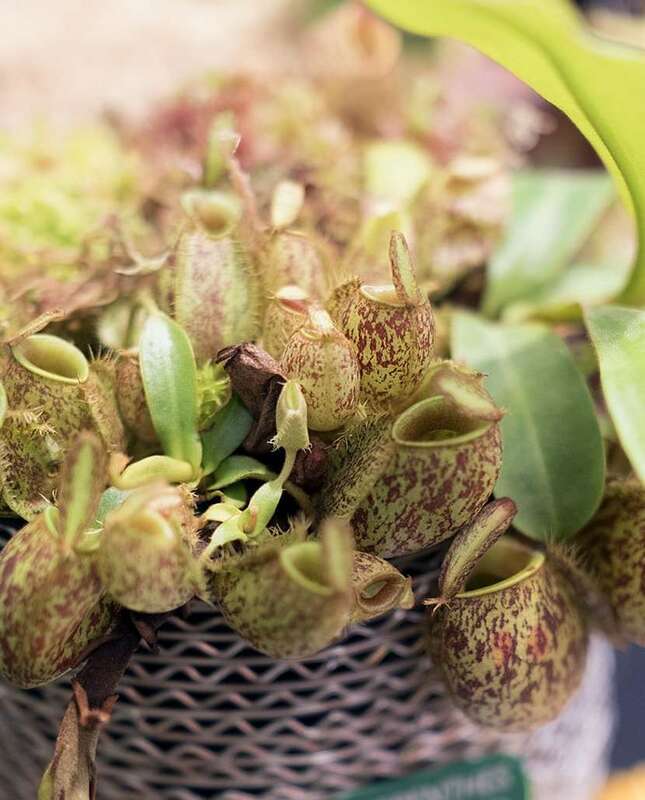 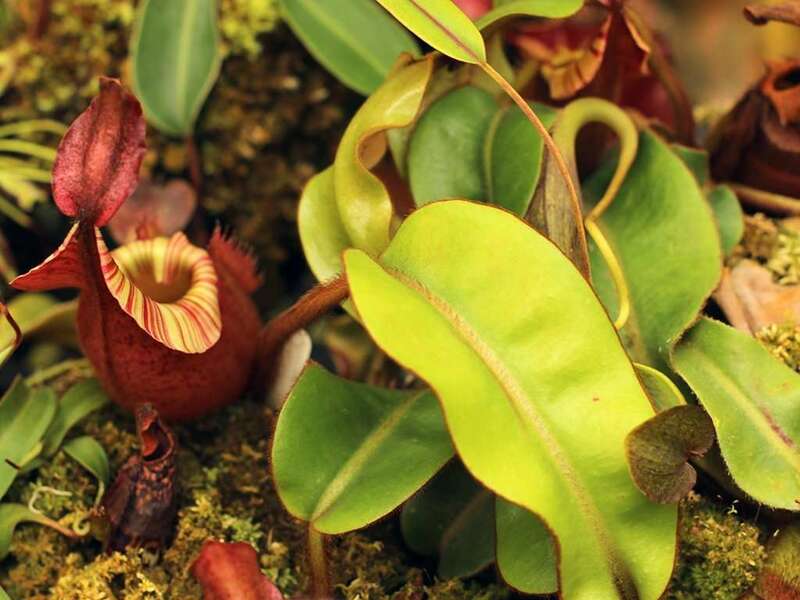 Leaves, tendrils, and pitchers on Nepenthes veitchii are all fuzzy-to-hairy (as if the carnivory alone wasn’t enough to encourage animal-like comparisons). 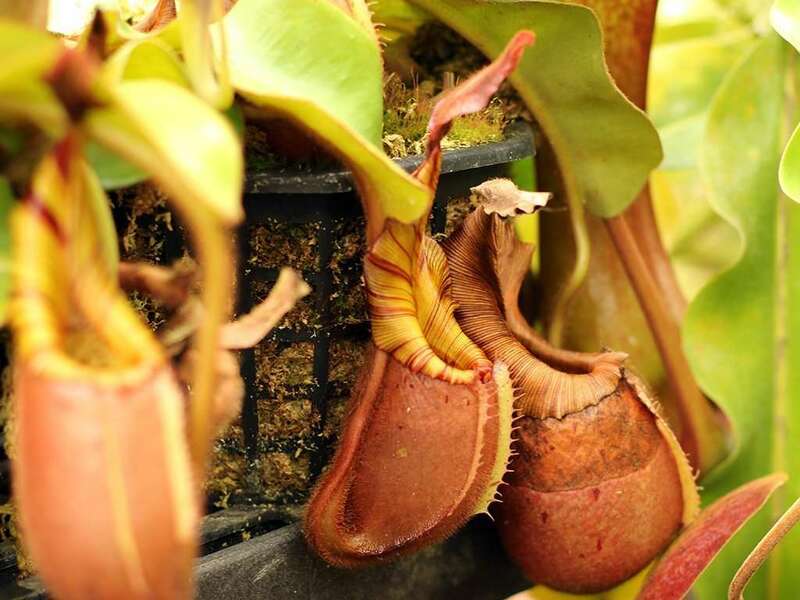 Large lower pitchers are tan, reach up to 12 inches tall, and can hold copious amounts of digestive fluids due to their squat shape. 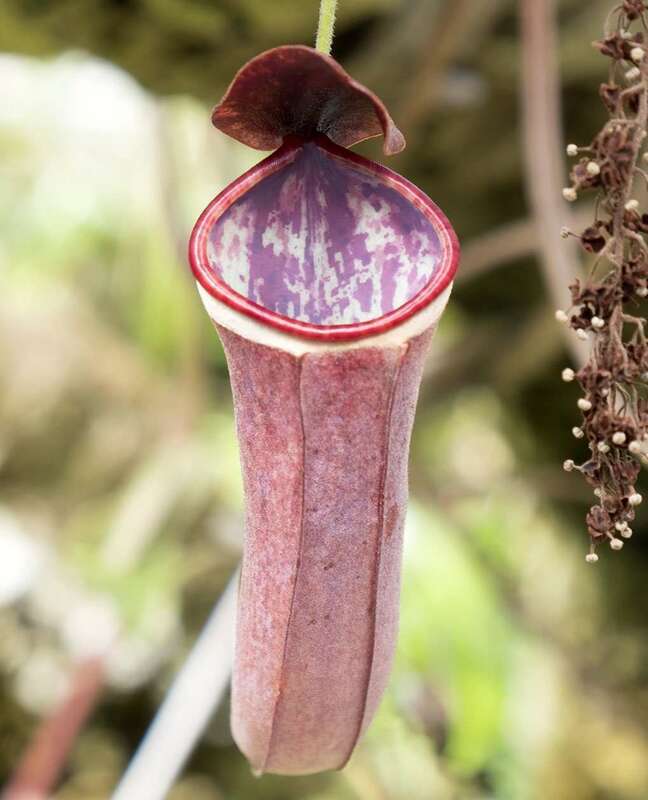 Wings on the front of the pitchers are pronounced and pitcher interiors are lightly blotched in red.